When I eat out, I almost always order pork sisig. Needless to say, I love sisig. There’s just something about the texture, flavor, and aroma of this coarsely chopped pork mask that excites my palate. And in Bacolod City, I have found top homemade sisig that I can just prepare at home without much fuss. Top homemade sisig in Bacolod that I have tried, from left: Leia C pork sisig, Ginger Lime chicken sisig, and Balay Namit Sassy Sisig (pork). 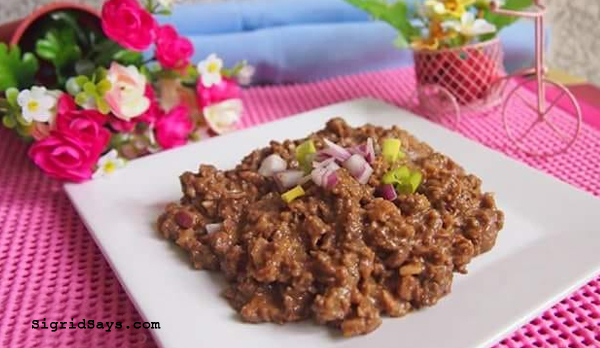 The sizzling pork sisig is a Kapampangan dish that has made its way all over the Philippines. I guess we just like our pulutan (pica) so much, so it usually accompanies drinks during happy hour. However, drinkers are not the only audience of pork sisig. 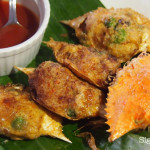 It has also become a favorite ulam of Filipino families, whether at home or in restaurants. Moreover, it seems that every region has their own version of the sisig, according to the taste preference and cooking styles of the locals. Sometimes, however, I get a hankering for sisig and I just want to cook it at home. Yep, despite what others may think, I am a homebody and would prefer to just dine at home with family. 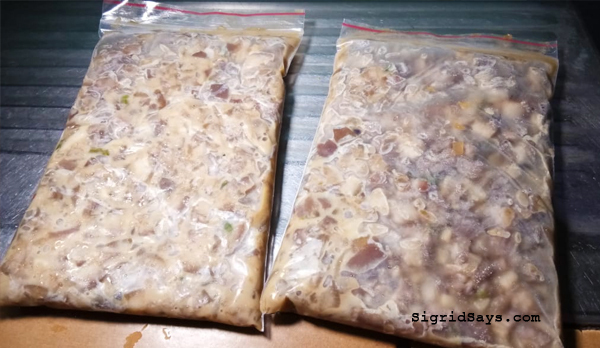 My solution is to stock up on frozen homemade sisig and then pop them on the pan whenever I want some. 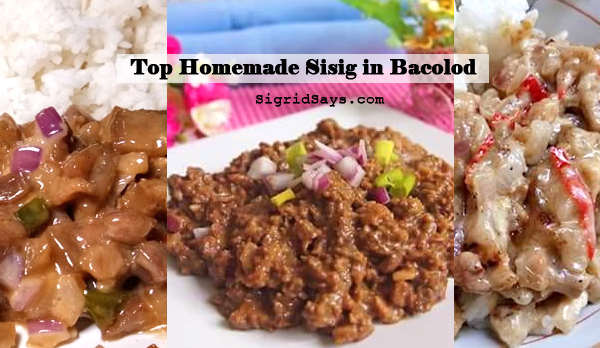 Here are the top homemade sisig in Bacolod that my husband and I like so much. 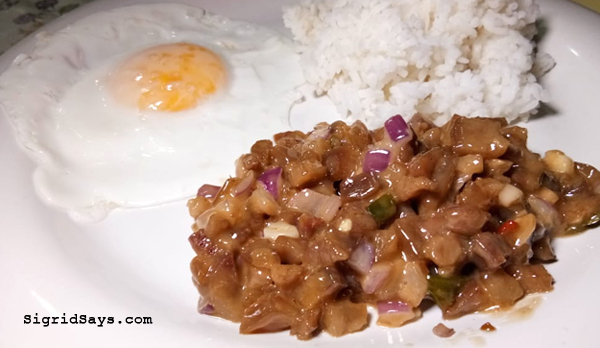 We like our homemade sisig served with rice and fried egg. 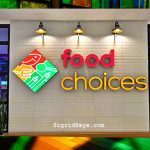 Their pork sisig is very tender, sweet, spicy, and saucy. It is leaning towards the brown saucy kind. 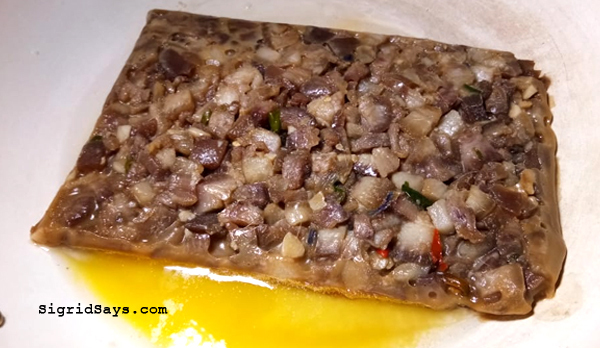 You might wonder how you can remove the sisig from the plastic pack. No problem. There’s no need to thaw it either. Just take it out from the fridge, cut the sides of the bag, and place it on your pan. You get every bit out of it. Leia C pork sisig in resealable plastic bags. Cooking Leia C pork sisig in butter. I like adding chopped onions and mayonnaise into the Leia C pork sisig. But you can just heat it and eat as is. My Leia C pork sisig is almost done so I added a dollop of mayonnaise. 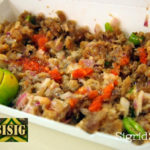 Leia C’s sisig is packed in resealable plastic bags. 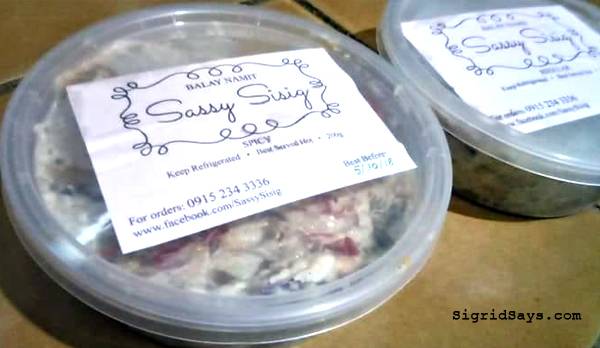 We like Sassy Sisig because there’s a bit of a crunch and is rather smoky. You achieve this by grilling the pork ingredients before slicing. It is already pre-mixed with mayonnaise so you don’t have to add to it while cooking. 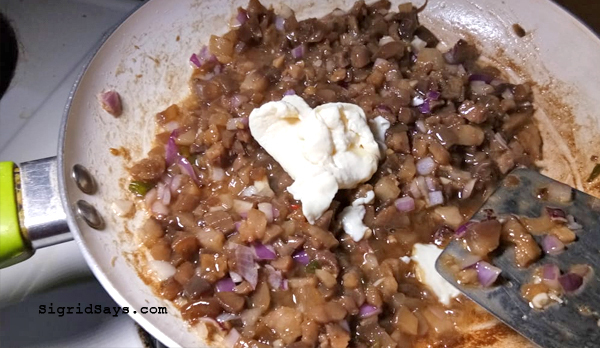 Just melt some butter, saute the onions for a minute, and add the Sassy Sisig. It is conveniently packed in a tub as well, so if you are alone, you can just cook half and stash what’s left in the fridge or freezer. 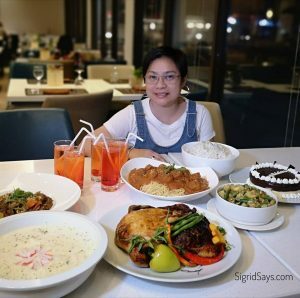 Ginger Lime doesn’t have a Bacolod restaurant anymore but you can still order their chicken sisig. Chicken sisig by Ginger Lime. 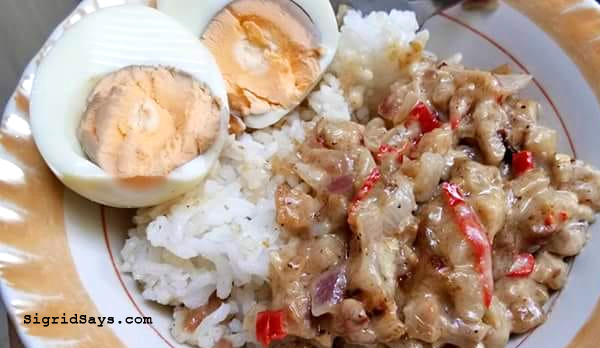 You have probably tasted other chicken sisig, which uses a lot of meat. Meanwhile, the Ginger Lime chicken sisig uses mostly the innards, which is more flavorful and packs in a lot of different textures. 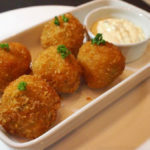 While this is made of chicken, consume in small amounts because remember the uric acid content. I also add butter, onions, and mayonnaise when I cook the chicken sisig. One time, I cooked several orders and served it as one of the dishes for my husband’s birthday. No, these are not Sigrid’s best friends. Sisig best friends are the things I add to make my homemade sisig taste even better. 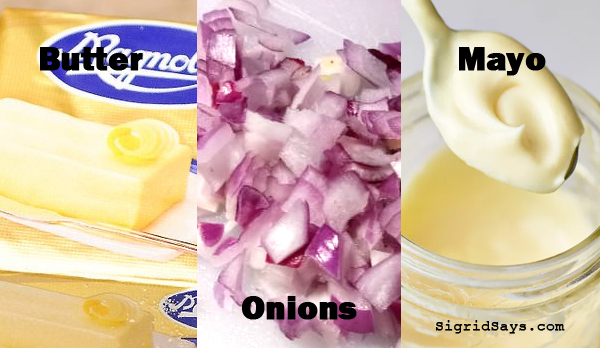 These are butter for frying, chopped onions, and mayonnaise. You can say that I add all three before, during, and after cooking. The three things I add to homemade sisig: butter for frying, chopped onions, and mayonnaise, which I mix when the sisig is already off the fire.